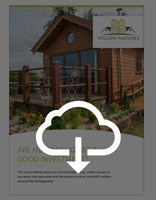 Once you have decided to invest in a holiday home investment property, it is important to choose the best holiday park location. Choose the right location for your holiday let to maximise your returns. A luxury holiday home with hot tub set in the wrong location can cripple your profits so consider all the options before you invest. Want to know what else to consider when choosing the location of your holiday home investment property? Download The Ultimate Guide to Buying a Holiday Home.